Cold War History, nature and street art in one spot! There’s no shortage of things to do in Berlin, true. But sometimes it’s nice to get out of the city. 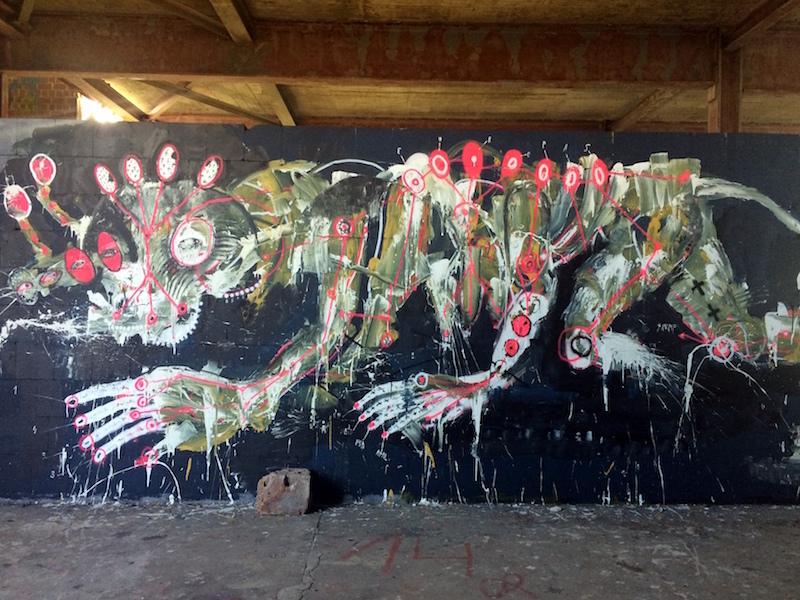 If you’re feeling particularly energetic and fancy a bit of “nature with an edge”, then you should definitely make the trip to Teufelsberg, the abandoned Berlin street art spy station. Not only will you get to experience a bit of Cold War history, you’ll also see some fantastic street art as you explore the area. 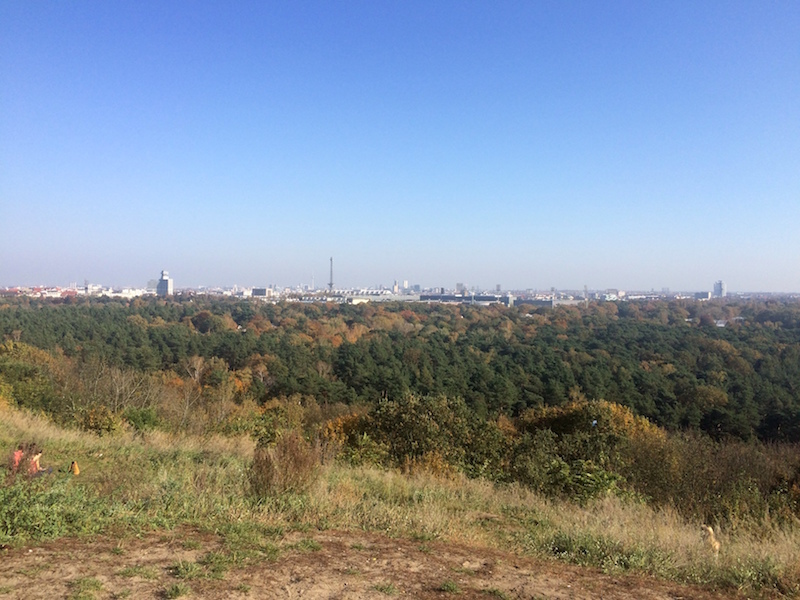 Teufelsberg (or Devil’s Mountain as it’s known in German) is located in the gorgeous Grunewald Forest and is a man-made hill built entirely out of rubble that was moved there from the city after the Second World War. You may have spotted the iconic domes from certain spots in the city, that’s because the site stands at about 120 metres high (so be prepared for a bit of a hike up!). There are some incredible views along the way and it’s nice to take a breather every now and then to enjoy the forest or take some photos. You’ll pass many other people as you make your way there either sitting and relaxing, cycling, walking their dogs and even paragliding. Apparently there are also wild boar that roam the forest, though we didn’t encounter any! Entrance to the site is a hefty €8 – while we read on some sites it’s possible to sneak inside, recently it seems as though the area is heavily protected with three different wire fences and there are also signs that say trespassers will be in trouble with the police, so we wouldn’t recommend it. According to the official website, the fee is used to create social projects and go towards the costs of electricity, water etc. We definitely think it’s worth going there at least once, just be sure to make a full day of it to get your money’s worth! Once inside, you’re immediately faced with a load of amazing street art. 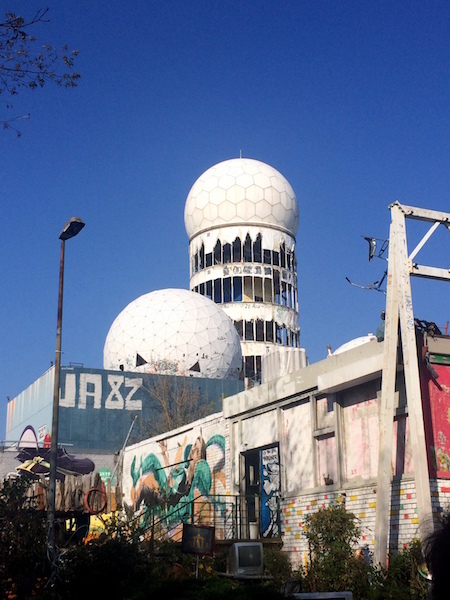 There’s also a small bar, some seats where you can chill and listen to music and a gallery displaying photos and some information on Teufelsberg’s history (though all in German). Here’s what we do know: the rubble brought from the destroyed buildings in Berlin kept piling up until it soon became the highest point in the former West Berlin. 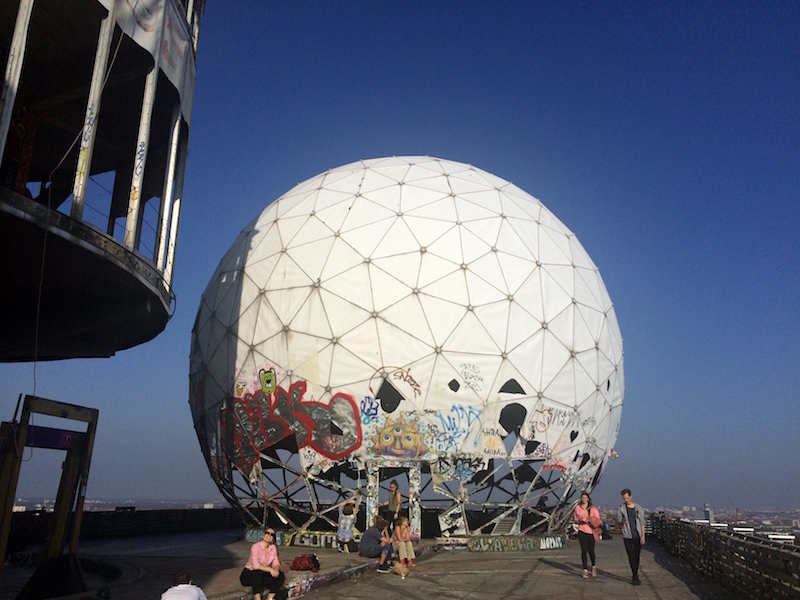 It was then that the US military decided it would be a good spot for a listening station, and so US spies occupied the space during the Cold War, utilising the height to build the now famous radomes on top. The area also covers a Nazi military technical college that was never fully completed and was so sturdy that it couldn’t be destroyed, so was just covered up with the rubble and became a part of the hill. The dumping of rubble continued up until 1972 and after the Cold War the Americans abandoned the site. Trees were planted to make the hill look more attractive and there was even a ski slope built so people could take advantage of its height (which is no longer there). Today, it’s a popular spot for visitors with tours running daily and also a place for artists to exhibit their work. There are a number of floors in which artists practice their skills on the walls, with the displays changing regularly. You might even catch somebody mid-spray. There are a lot of stairs to climb to get all the way to the top, but it’s totally worth it for the incredible views from up there, so make sure you pack your camera. To get to the top of the largest radome do be careful as there’s no light when going up the stairs, but once inside you’ll experience a really unique echo, guaranteed to keep you entertained for a while as you make as many funny sounds as you can. We were lucky enough to go on a sunny day but we think it would be spectacular whatever the weather! You can get there from Mitte by taking the S5 to Heerstraße, then it’s about a 30 minute walk to the top. 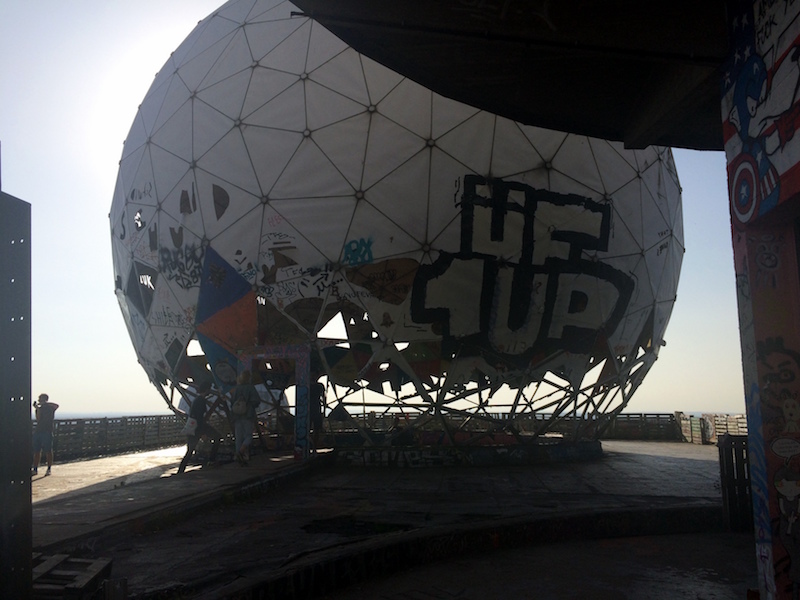 Find more information about Teufelsberg, abandoned Berlin street art spy station here (site only in German). *Written by Natalie Lunt and edited by Tulio Edreira.